Join us for celebration and merriment on Saturday, April 28th at the Crowne Plaza Lord Beaverbrook Hotel in Fredericton. This is our biggest and most important fundraiser for the year. Comedian Lloyd Ravn, Matt McGuire and the Raging Grannies will be on hand to entertain us. You can bid on Old Town canoes, a bicycle, a VIA Rail trip to Montreal, and many more items that will help you get into the swing of things this Spring. 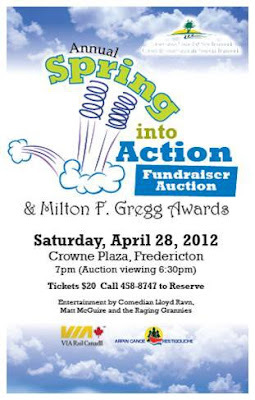 We will of course, present our annual Milton F. Gregg Conservation Awards to New Brunswick's Eco-Heroes for 2012. Doors open at 6:30 pm to view the auction items. The program gets underway at 7:00 pm. Tickets are $20 and can be reserved by calling CCNB at 458-8747.